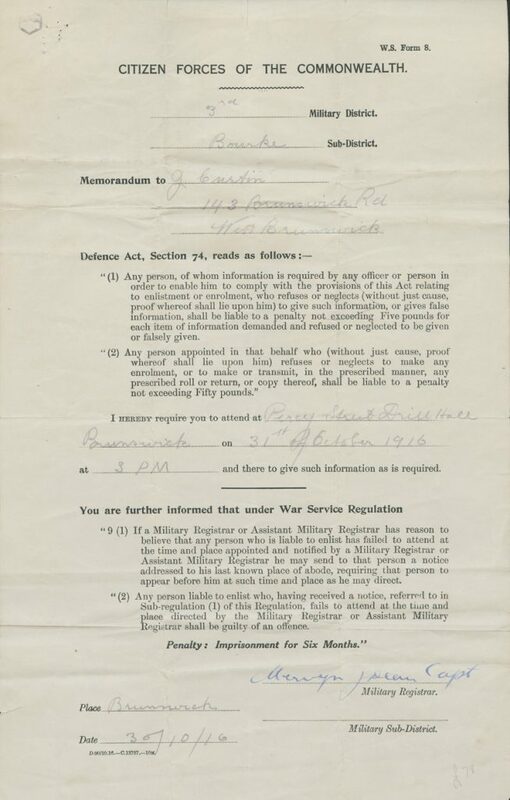 Filed between a letter and a pamphlet, Object 45, the W.S Form 8 Citizens Forces of the Commonwealth, is the call up notice requiring John Curtin to attend Percy Street Drill Hall, 31 Oct 1916 (JCPML00402/12). This single piece of paper set in chain the events that saw John Curtin arrested and sentenced to a term in prison. A few weeks before the first conscription referendum was taken on 28 October 1916, the proclamation enabling the Commonwealth of Australia to ‘call upon’ single men between the ages of 21 and 35 to ‘enlist and serve as required’, and to attend military training came into effect, on 2 October. Notices ordering men to report for training were placed in newspapers across the country, and Curtin would have been aware that he had been expected to attend the place of enrolment in Brunswick on 3 October (The Age, 2 October 1916, p2). 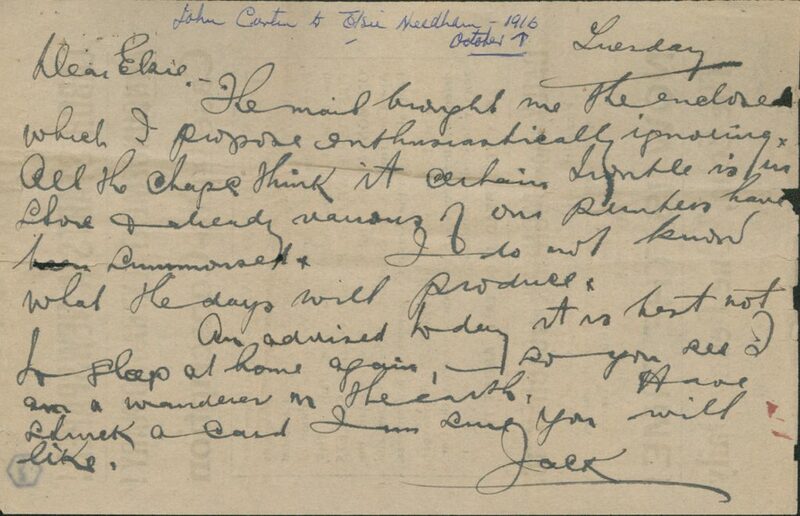 John Curtin received his W.S Form 8 call up notice to attend military training at the end of October 1916. He then did two things – he first sent the form to Elsie in Tasmania, with a letter scrawled on the back of a flyer. The second thing he did was to evade the arresting officers who would come to look for him by not returning to his home. He then went to see Elsie in Hobart before heading to Sydney. 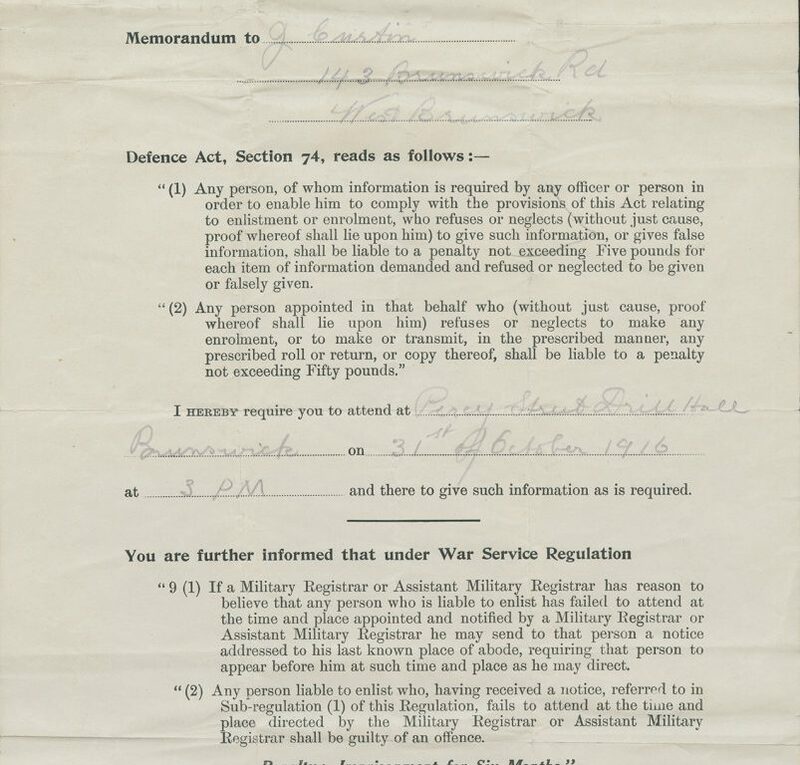 Curtin faced a maximum of 6 months imprisonment for failure to attend military camp. He was represented in court by Maurice Blackburn, who argued that his client could not be contacted. The charge was heard in his absence and on 22 November Curtin was sentenced to three months imprisonment. When he did turn up on 12 December he was arrested and ‘placed in the Melbourne Gaol’. The proclamation had in fact been revoked on the day Curtin was sentenced, but he was to spend three days in the gaol before he was released. bars & keep me safely confined within. His relief was palpable, and he would have been very glad to not be spending Christmas in gaol. 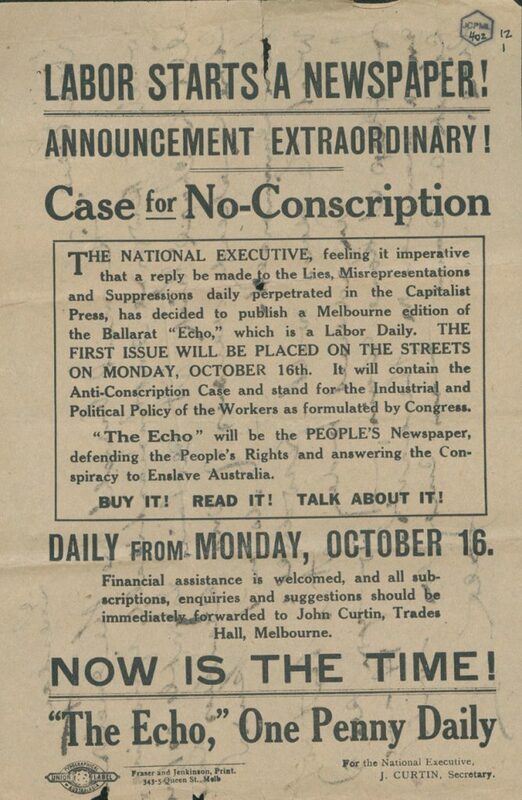 As Prime Minister, John Curtin the former anti-conscription leader would succeed in changing Labor Party policy on conscription in 1942, one of the most difficult challenges he faced in leading his party. John Curtin’s reputation as the only Australian Prime Minister to have served a gaol sentence continues to this day. Previous Previous post: 44. Minister McCallum’s Press Cutting Album, 1924-1928.